Earlier this week, I heard about the architect Jug Cerovic who re-shaped various maps of the underground, including the London Tube. 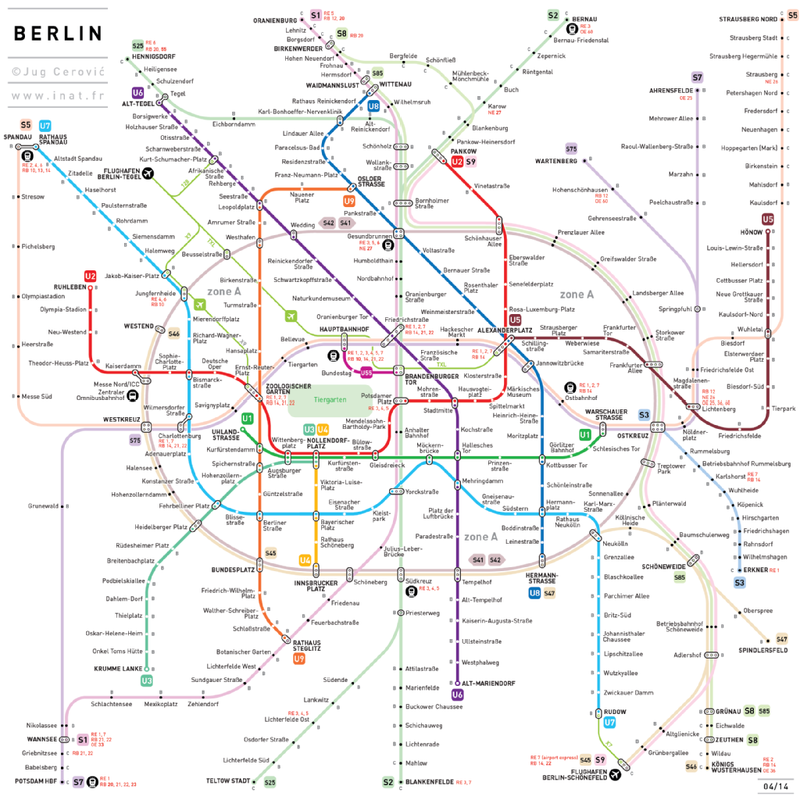 After I briefly took a view on his new design for the U-Bahn Netzspinne (the Map of the Berlin Underground), I only noticed a few minor changes. 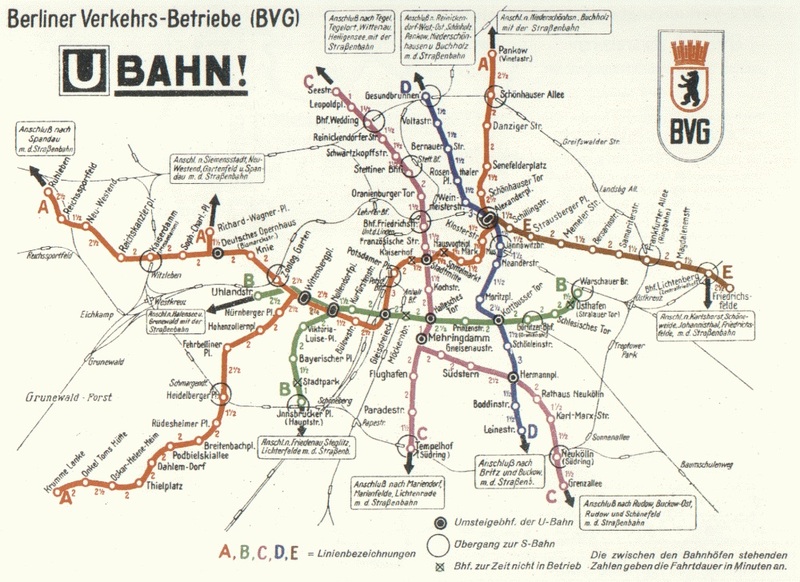 For example, the Ring-Bahn is a circle shape now – which is mostly an aesthetic difference. 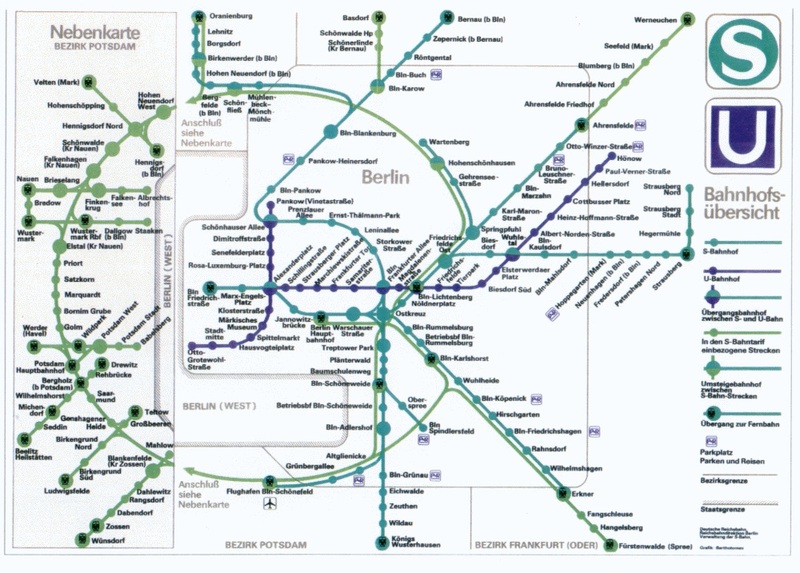 Secondly, the Tiergarten park is shown on the map. I’m unsure about the reason for this, but it comes as a bit redundant to me. At last, which is the only mistake of a certain importance in the new design, is the new scale of the S3. It looks like Erkner is not much further than Schöneweide. Don’t get me wrong, I also encourage people to visit the outskirts of the German capital – but I won’t lie about the distances! However, this post is not meant to be a critique. 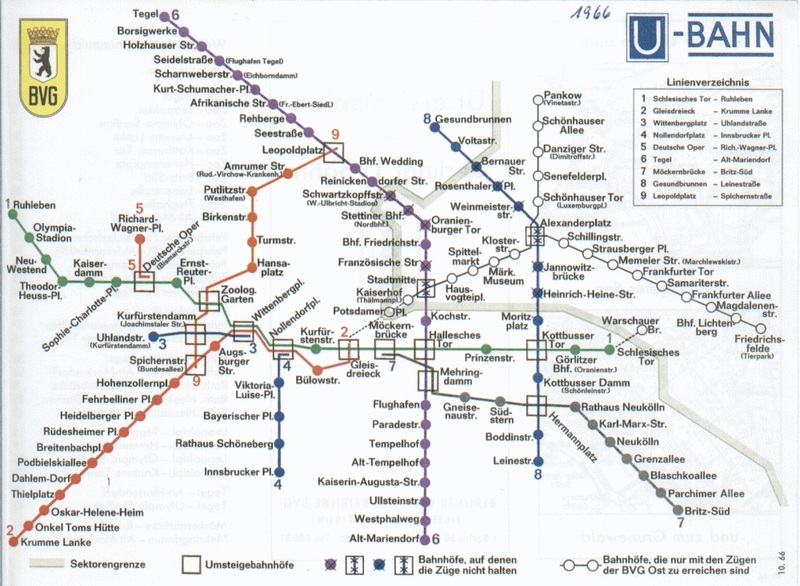 Cerovic doesn’t even have the goal to replace the U-Bahn Netzspinne. 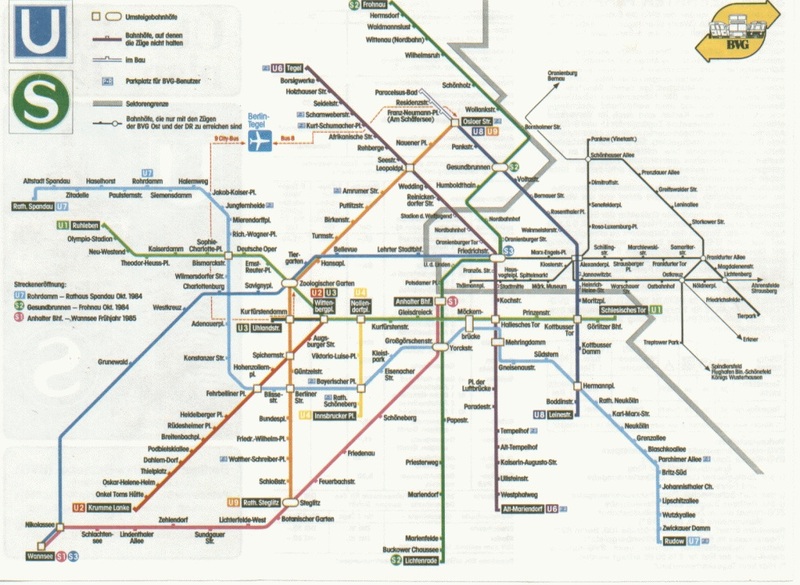 The news about this, just made me realise that I’ve once been looking for old versions of these public transportation maps earlier. It reveals a long history of trams, being replaced by an expending underground. 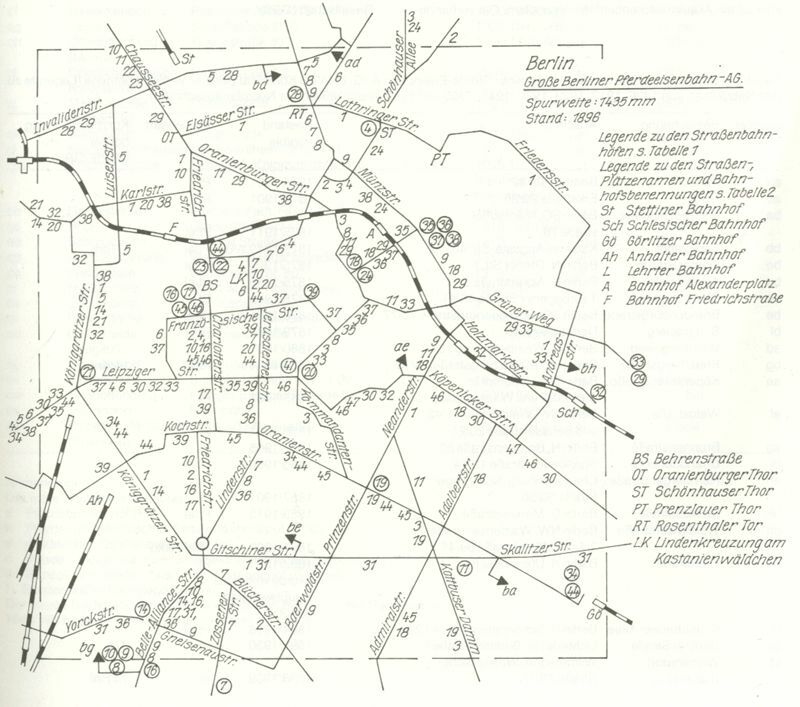 Names have changed from Reichskanzlerplatz to Adolf-Hitler-Platz and back to Reichskanzlerplatz before it was named Theodor-Heuss-Platz. 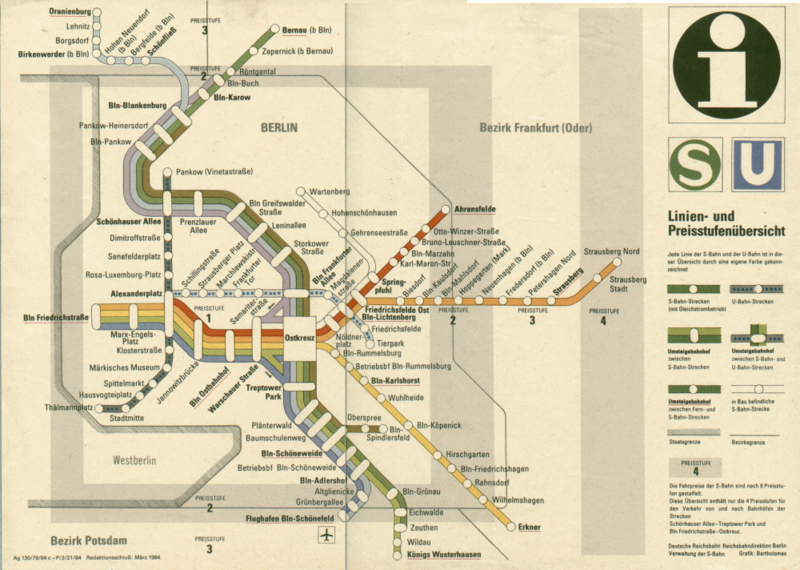 A turbulent era for the U-Bahn started when the Berlin Wall was build in August 1961. 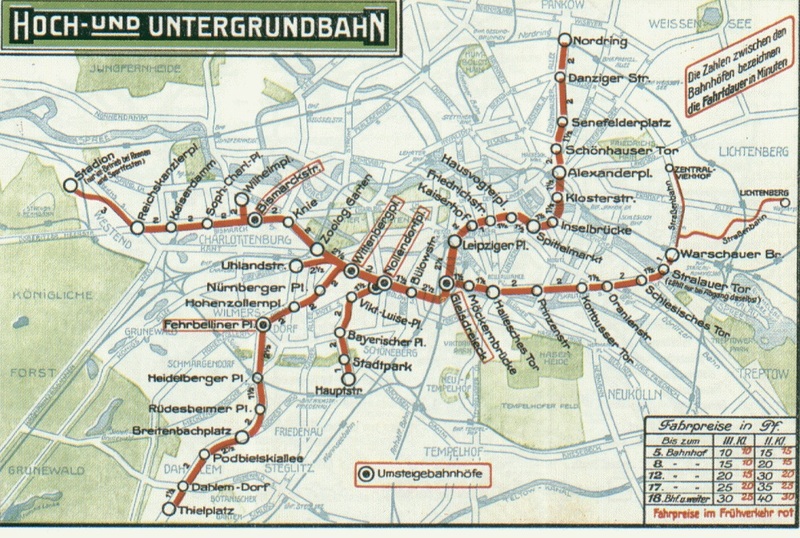 The ‘Underground Wall’ turned various East Berlin stations into ghost stations. 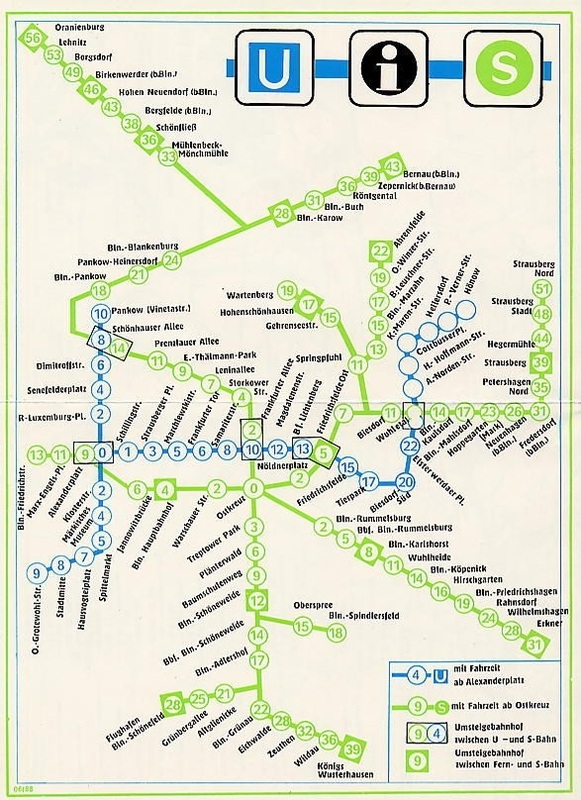 East-German maps of the public transport don’t even show the existence of West Berlin. All summed up: a serious thrill! 1936. Notice the ‘Adolf-Hitler-Platz’ and the ‘Horst-Wessel-Platz’. 1947. Stations marked with a cross were damaged in World War II & out of use. 1966. 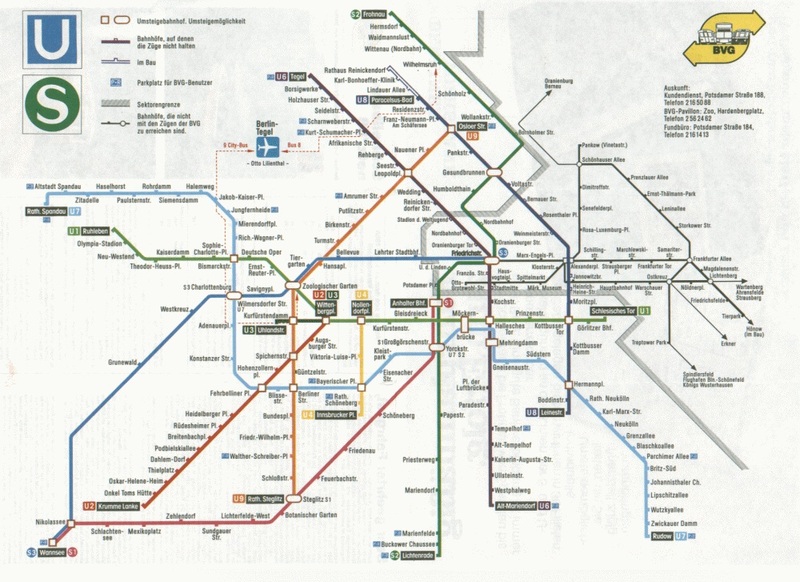 West Berlin’s map. 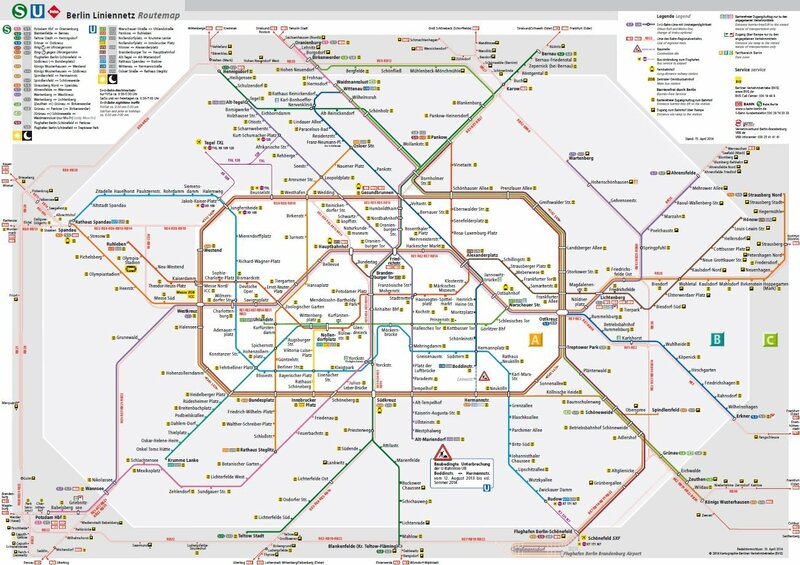 White stations are East Berlin. 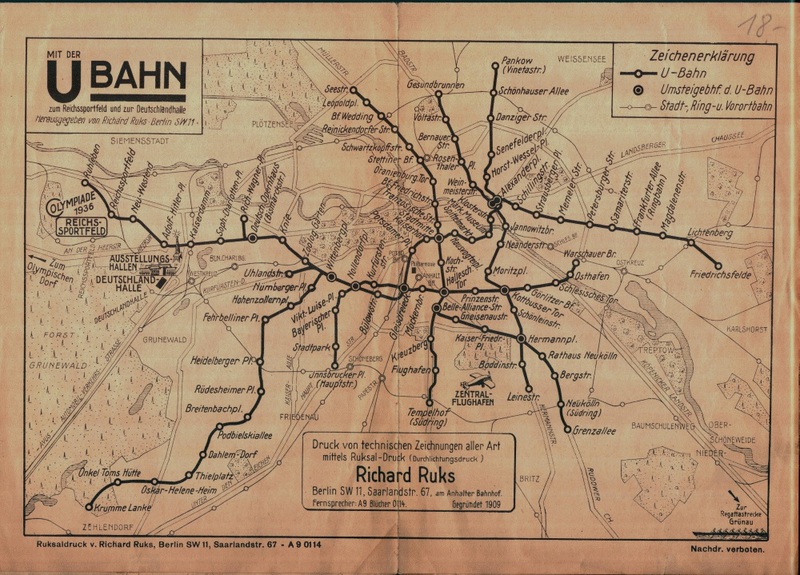 Stations with a cross are on a Western line but in Eastern territory; the so-called ghost stations. 1984. 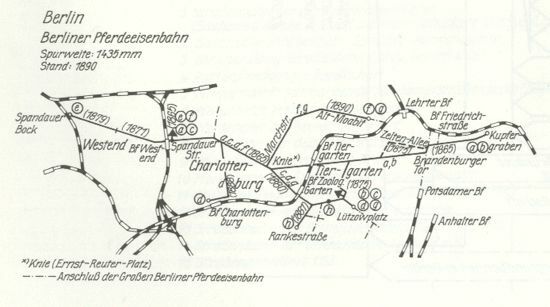 East German, only S-Bahn stations. 1988. East German. Notice the way of ignoring the existence of West Berlin.